The name and address on the bottom of the photograph is, 'T Atkinson, 8 Union Place, Portobello' and the reverse is blank. Union Place was the name given to a section of the south side of the High Street running from beyond where Pizza Hut and Ladbrokes are today towards Windsor Place. The terraced house are still there..
Do you have any information on Mr Atkinson?" 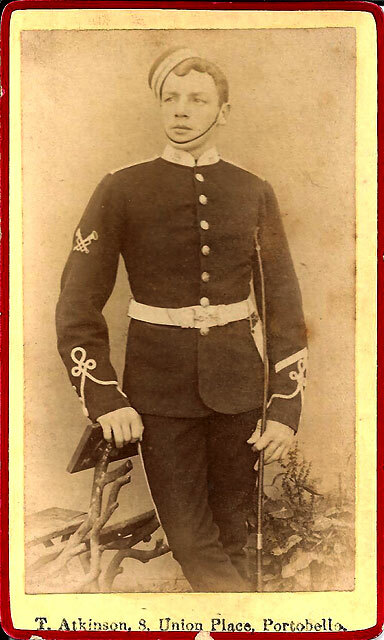 Unfortunately I don't have any answers to Archie's questions, other than to say that judging by the style of this carte de visite, with the photo mounted on red card, I think that the photo may have been taken around the 1890s, or possibly 1880s. The photographer is also new to me (as well as being new to Archie). I have searched all the trade directories that I have been able to find covering Portobello, and have found no mention of him in any of them. This is the first new name that I have found to add to my list of several hundred Edinburgh photographers for probably about three years. If you hae any information about T Atkinson, or his studio in Union Place, or about the uniform that the sitter is wearing, please email me to let me know, then I'll give you Archie Foley's email address and you can try sending a message direct to him.